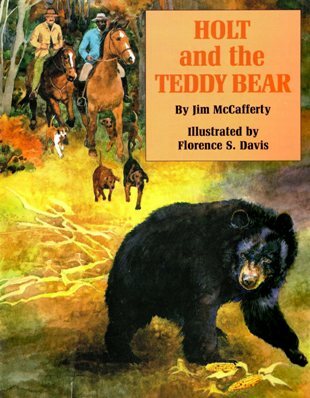 Jim McCafferty is the author of The Bear Hunter: The Life and Times of Robert Eager Bobo in the Canebrakes of the Old South, Hunting Bear and Panther in the Old South: The Writings of Dr. Henry J. Peck of Sicily Island, Louisiana, and two children's books, Holt and the Teddy Bear and Holt and the Cowboys. The Kindle version of The Bear Hunter can be previewed or purchased here. For additional information on the individual books, follow the title links below. 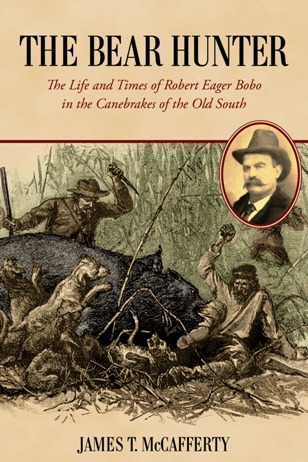 The Bear Hunter: The Life and Times of Robert Eager Bobo in the Canebrakes of the Old South currently is available in hardback in bookstores in Memphis, Tennessee, and in various towns and cities in Mississippi. For the bookstore closest to you, see the list of bookstores selling The Bear Hunter at this site's News/Events page under "News." Autographed copies of The Bear Hunter are available directly from the author, as well. The book sells for $24.95 plus $3.95 shipping and handling ($1.00 extra shipping for each additional book). Mississippi residents add $1.75 sales tax per book. Send your check or money order (no cash; we do not take credit cards at this time) to James T. McCafferty, Post Office Box 822, McComb, Mississippi 39649. Email info@canebrakes.com for additional information. The Bear Hunter also is available in a Kindle edition. You can read the first four chapters for free and read Kindle reader comments by following the Kindle link. For more about this book, click here. 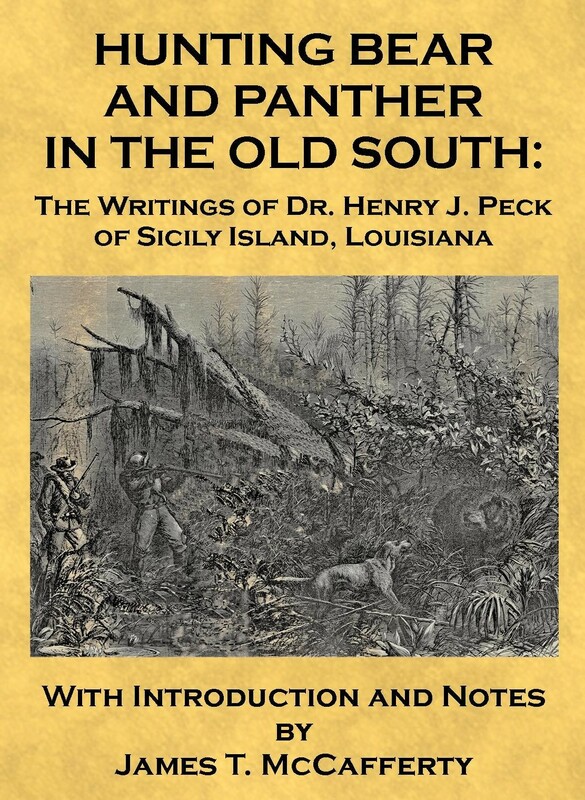 Hunting Bear and Panther in the Old South: The Writings of Dr. Henry J. Peck of Sicily Island, Louisiana, a relatively short book currently available in Kindle format, only, introduces Peck’s writings with a brief biography of Dr. Peck (1803-1881) and an overview of the works collected. The book contains not only Peck’s writing on the life cycles and the hunting of the animals named in the title, but also includes articles on hog and deer hunting in his day. In this book readers will find rarely encountered details concerning the weapons and methods used by 1840s Southern sportsmen, including a description of the “fire hunting” of deer, the making of the knives used by bear hunters, and accounts of dangerous—and even deadly—encounters with panther and bear. One of the two appendices to the book adds Peck’s personal investigations and opinions concerning early 18th century battles between the French and the Natchez Indian tribe that took place on or near his appropriately named Battleground Plantation. Hunters and lovers of Southern history will not be disappointed in this book. Buy the book here. Holt and the Teddy Bear is the story of President Theodore Roosevelt's 1902 Mississippi bear hunt that resulted in the naming of the world's favorite toy, the Teddy Bear. For more about this story, click here. Ask for Holt and the Teddy Bear at your local bookstore or order an autographed copy directly from the author. The color illustrated book, currently available in paperback, only, sells for $9.95 plus $2.50 shipping and handling ($.50 extra shipping for each additional book). Mississippi residents add $.70 sales tax per book. Send your check or money order (no cash; we do not take credit cards at this time) to James T. McCafferty, Post Office Box 822, McComb, Mississippi 39649. Email info@canebrakes.com for additional information. A few years after the close of the War Between the States, Holt traveled to the Waco, Texas, area in hopes of securing a job on the ranch of General Sullivan Ross, a prominent Texan who was elected governor in 1886 and later became president of Texas A & M University. Holt had served as a scout for Ross's Texas Brigade during the War. 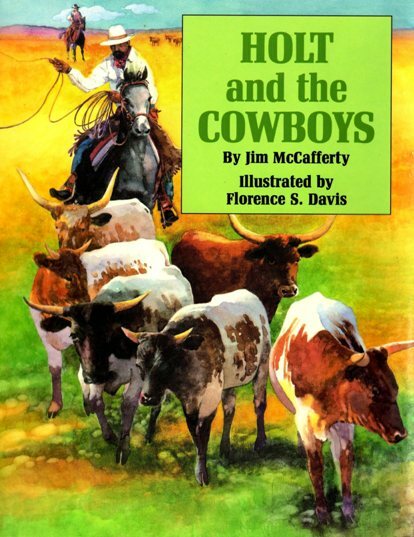 Holt and the Cowboys recounts Holt's first meeting with a Texas ranch foreman who thought he would trick Holt by having him attempt to ride an "unrideable" horse. The story recalls how Holt outsmarted the horse and the foreman, and won a job and some new friends in the process. For more about this story, click here. Ask for Holt and the Cowboys at your local bookstore or order an autographed copy directly from the author. The color illustrated book, a hardback, sells for $12.95, plus $2.75 shipping and handling ($.50 extra shipping for each additional book). Mississippi residents add $.91 sales tax per book. Send your check or money order (no cash; we do not take credit cards at this time) to James T. McCafferty, Post Office Box 822, McComb, Mississippi 39649. Email info@canebrakes.com for additional information. Both children's books are recipients of the National Christian Schools Association [NCSA] Children's Crown Collection designation, an annual listing of twenty children's book titles recommended by the NCSA "because they are well-written, they promote strong values, and they contain positive and uplifting themes," according to librarian Sandra Morrow, who established the Children's Crown Collection program in 1992.